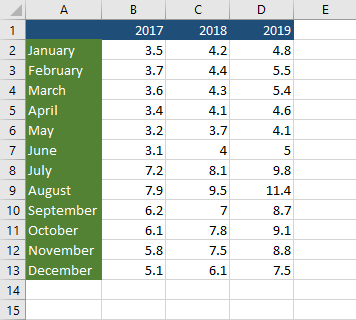 When you try to calculate the growth of your company, comparing data to the previous month is not always the best idea because the company may have a peak and low demand seasons. 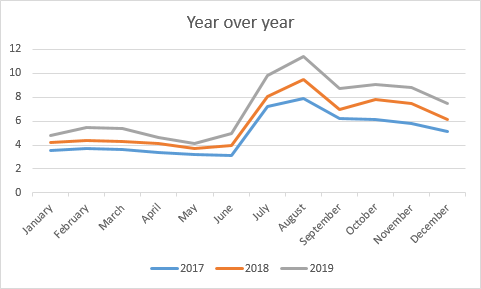 The year over year comparisons helps to analyze the company’s performance and avoid seasonality. For example, many companies have big demand seasons during holidays shopping season. Instead of comparing the current month to the previous one, it takes the current month and compares it to the same month last year. It’s an easy and efficient way to check whether the company’s performance is improving or worsening. From the current month, sales subtract the number of sales of the same month from the previous year. If the number is positive that the sales grew. Divide the difference by the previous year’s total sales. Convert the value to percentages. This is how the chart looks like. You can copy the following table. If you want to calculate YOY growth for August 2019, use the following formula.